The Breakdown: Will Dodd’s Financial Reform Bill Protect Consumers? This week on The Breakdown: The time for comprehensive financial reform and consumer protection has finally come. Christopher Hayes asks Demos's Heather McGhee, does Dodd's financial reform package deliver? 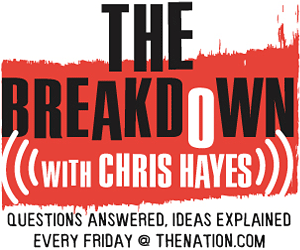 Editor’s Note: You can now subscribe to The Breakdown as a podcast on iTunes! Over the last decade, American consumers have watched the economy collapse at the hands of deregulation and deviant practices. They have witnessed and suffered, among other abuses, toxic sub-prime mortgages, exorbitant overdraft charges, deceptively high interest rates, and maliciously motivated pay day lenders. Now amidst one of America’s worst recessions, the time for comprehensive financial reform and consumer protection has finally come. This week Senator Chris Dodd, the Chairman of the Senate Banking Committee, unveiled the Senate’s financial reform package. On this week’s The Breakdown, special guest star Heather McGhee, Washington director of Demos, joins DC Editor Chris Hayes to discuss consumer protection in the context of Dodd’s reform legislation. The Washington Post reports that financial reform is headed to a strict party line vote in the Senate. Guest star Heather McGhee explains why a consumer financial protection agency is crucial for reform. Top consumer protection advocates, including Elizabeth Warren and Senator Sherrod Brown, express guarded support for Dodd’s proposal.